Photo from the ward: This photo was submitted to the MVCA's 'Going to the Dogs' photo contest. Dude, a 3 year old Bernese Mountain Dog, loves David Bartlett Park, especially in the winter! To begin this week, I would like to thank residents for taking the time to attend the open house last week for the proposed roundabout at the intersection of Barnsdale Road & Prince of Wales Drive. The feedback was quite positive to the rationale and design. Construction is tentatively scheduled to start in 2019 pending budget approval. Staff will now move to detailed design. For more information, please visit www.rideaugoulbourn.ca/barnsdaleroundabout. Any comments may be sent to Kunjan Ghimire via email at Kunjan.Ghimire@ottawa.ca or by phone at 613-580-2424, ext. 21685. While at the open house, many residents also asked about the intersection of Prince of Wales and Bankfield Road. You may recall that I had been working on a plan for 2018 to implement turning lanes on Bankfield Road. Through further discussion and examination, staff have come back with a more comprehensive plan that also brings in the required upgrades to the First Line Road and Bankfield Road intersection. The plan is still being finalized and I will share that when it is available. What we are now looking at are new turning lanes in all directions at Prince of Wales and Bankfield in addition to signalization of the First Line Road intersection. Staff are currently working toward a spring 2019 timeline for construction. Previously, the City approved plans for a roundabout at Prince of Wales and Bankfield as well as a realignment of First Line Road into a new roundabout 300m south of Bankfield on Prince of Wales. While still the plan for the future, it simply is not affordable in the short term. Through the next Development Charge By-Law review, staff will recommend these projects for inclusion in that by-law so that all future development in Manotick is paying into the plans for those improvements. The March 1st meeting of the Agriculture & Rural Affairs Committee has only two items on the agenda. Both affect Rideau-Goulbourn. The main item will be the Engineer’s Report on the Cranberry Creek Municipal Drain, in North Gower and Kars. The second item is an amendment to the Zoning By-Law for the Caivan development at 6350 Perth Street in Richmond. That report just fixes the various zoning boundaries within the development to align with the blocks and lots within Phase 1 of the subdivision. The Cranberry Creek Municipal Drain item dates back to 2012 and beyond. After a very wet spring in 2012, landowners on this Municipal Drain (MD) raised concerns about the maintenance of it. As of approximately 1991, the MD actually lacked a pump and dyke system that allowed it to operate as per the approved Engineer’s Report. In essence, the MD has not been properly functioning since that time. The drain itself was originally constructed in 1895 but the pump and dyke were installed following an updated Engineer’s Report in 1969. That system remained in place for over two decades but it was considered insufficient based on the volume of water it could handle. An updated report in 1991 recommended upgrades to the pump and dyke at that time but it was not accepted by Rideau Township and the landowners at that time. As mentioned above, the matter resurfaced nearly six years ago leading to our current report. In September 2014, the City appointed Robinson Consultants to update the Engineer’s Report and bring forward a plan to have the MD function as was intended and also to clean it out to its original depths. This report brings that forward. Landowners assessed by this MD received the Engineer’s Report in recent weeks which outlines the proposed works as well as the assessment values. Being a significant watershed, there are many properties affected by these drainage works. While the Cranberry Creek MD Engineer’s Report comes to our Committee for approval, it is actually the Drainage Act that outlines the process. I understand that the assessments can create undue burden on affected landowners and I have committed to doing what I can to find some financial assistance to lower those assessments. That work will likely continue right through into April when this matter returns for the Court of Revision process. The purpose of the Agriculture & Rural Affairs Committee meeting will be to discuss the Engineer’s Report. Andy Robinson, Drainage Engineer, will be presenting to the Committee. For those wishing to appeal assessments, that opportunity comes during the Court of Revision, which is scheduled for Monday, April 23rd at the Alfred Taylor Recreation Centre in North Gower. The Thursday, March 1st meeting of ARAC takes place at 10:00am at Ben Franklin Place. During the 2018 Budget deliberations, City Council was made aware of a $10M surplus, which was then directed to infrastructure renewal. At the Finance & Economic Development Committee of February 5th, staff brought forward a report on how the $10M would be spent in 2018. I am pleased to report that nearly $2M of that amount will be spent in Rideau-Goulbourn. Approved at the February 14th meeting of City Council, the report includes pavement preservation projects on Eagleson Road (Perth to Brophy), Old Richmond Road (Fallowfield to Hope Side Road) and Dwyer Hill Road (Fallowfield to Highway 7). The report also includes the resurfacing of Potter Drive and the portion of Barnsdale Road, between Moodie Drive and Twin Elm Road. On that, I have asked staff to take a second look and determine whether it would be more beneficial to resurface a portion of Barnsdale Road east of Moodie Drive instead. They are currently looking into that. Rideau-Goulbourn was home to multiple Winter Carnivals including Fallowfield Village's Annual Winter Carnival, Manotick's Shiverfest, Munster Winter Carnival and North Gower's 56th Winter Carnival. Thank you to Grace Thrasher from the Manotick Village & Community Association for the photo from Shiverfest and to Jessica Breckenridge from the Munster Community Association for the photo from the Munster Winter Carnival. For more photos from Winter Carnivals in Rideau-Goulbourn, visit: www.facebook.com/rideaugoulbourn. The City of Ottawa is asking residents to weigh-in on how to spend more than $450,000 in the Vehicle-for-Hire Accessibility Fund. Residents can have their say by completing an online survey. The Vehicle-for-Hire Accessibility Fund Consultation Questionnaire is available on ottawa.ca from January 24 to February 16. Money in the Vehicle-for-Hire Accessibility Fund is generated through a voluntary surcharge paid by private transportation companies (PTC), such as Uber Canada. The surcharge was implemented because many PTCs cannot currently accommodate persons who use mobility devices including power wheelchairs and scooters. An information package that includes background, details and definitions of all these terms can be found on the public consultation page of ottawa.ca. Please note that I have encouraged Rural Ottawa South Support Services to seek funding through this Fund to help with their transportation efforts. Similar suggestions from residents in the rural area would go a long way. As a reminder, there is an open house upcoming to discuss plans for a roundabout at the intersection of Barnsdale Road & Prince of Wales Drive. Construction is tentatively scheduled to start in 2019 pending budget approval. The open house is scheduled for Thursday, February 15th from 7:00pm to 9:00pm and will be held at the Rideau Valley Conservation Authority building at 3889 Rideau Valley Drive. For more information, please visit www.rideaugoulbourn.ca/barnsdaleroundabout. Any comments may be sent to Kunjan Ghimire via email at Kunjan.Ghimire@ottawa.ca or by phone at 613-580-2424, ext. 21685. Comment on this open house should be submitted by Tuesday, February 20, 2018. The TD Park People grant program was created to support community groups to host events in urban parks or public green spaces. Through this grant, TD hopes to lay the groundwork for long-term sustainable community partnerships in parks across each of the selected cities (Toronto, Montreal, Vancouver, and Ottawa). Groups who demonstrate the ability to successfully organize and host events, as well as sustain their group beyond this grant cycle, are encouraged to apply. Their expectation is that successful applicants host at least three events between April and December 2018 with each event open to all members of the larger community. Eligible groups include volunteer-based park groups, local agencies, resident associations and non-profits that are active in their local parks. Eligible expenses include honoraria for volunteers, event materials, supplies and equipment, printing of promotional materials with provided templates. Essentially, any reasonable event expense can be covered by the grant. To apply, visit https://parkpeople.ca/parkgrants/. Applications are due by the end of the day on March 5, 2018. Funding decisions will be made in April, with cheques sent in May. I am also currently working with the Potsdam Junior Hockey Association and Richmond Munster Minor Hockey Association on celebrating the 60th Anniversary of the original Silver Stick Tournament that was held in Richmond in February 1958. Games are tentatively scheduled between the two clubs for Sunday, February 25th between 10:00 am and 1:00 pm followed by the Richmond Royals Junior B game vs. Winchester Hawks. We are still confirming which teams will be playing. For more information on these events, please visit: richmond200.ca. Interested in a fun, interactive session of dance, laughter & music? Join the Ever Hopeful Stringband and caller Pippa Hall for a family-friendly, alcohol-free evening of community dancing, including circles, squares and contras on Friday, February 23rd from 7:00pm to 9:30pm at the Manotick United Church. Each dance is taught and the whole family is invited. The evening begins with simple dances, followed by dances that build on skills as the evening progresses. Adults are $10, children aged 12-18 are $5 and anyone under 12 is free. There is a family max of $20. For more information, please call 613-692-4576 or visit http://dance.manotick.net. On February 13th, from 5:00pm to 7:30pm at the Alfred Taylor Recreation Centre, come and enjoy a hearty supper of pancakes and syrup, ham, sausages, baked beans, fruit salad and homemade pies, with coffee, tea, juice or water. Cost is just $10 per adult, $5 children 6-12, and children 5 and under free. This supper is hosted by Holy Trinity Anglican Church, North Gower. For more info, call 613-489-2207. The Munster United Church invites you to their 7th Annual Spaghetti Dinner on Saturday, February 24th between 4:30pm and 7:30pm. Your spaghetti dinner includes a Caesar salad, rolls, ice cream, cookies and coffee or tea. Gluten free pasta is also available. There is no charge for the dinner but the church will be accepting donations. Take out is also available. The Munster United Church’s youth group will be on hand collecting tips for Big Sky Ranch. Last week, we held the last meeting of the Agriculture and Rural Affairs Committee until September. While there were only two items on the agenda items from Rideau-Goulbourn, they were both zoning applications within the village of Manotick. 5514 Manotick Main Street, also known as the Falls House property, has been featured prominently in this column for over two years. The proposal, as many of you know, is for a new three storey office/commercial building at the corner of Bridge Street and Manotick Main Street. This replaces the former Falls House that was demolished last fall. The zoning application seeks to realign the zoning of the existing property with a parcel of land that was added to it so that the entire property has a uniform zoning and can meet the parking requirements for development. There are also some minor changes to setbacks and height but the building retains the three storey limit as set out in the Manotick Secondary Plan. In recent months, community leaders have assisted me in refining the design and developing a softer look to the building. While there are still some modifications to be made, the most recent design and background on the property can be found at rideaugoulbourn.ca/fallshouse. I encourage you to visit the site and see the updated design. The owner and the architect are still making refinements in collaboration with various community leaders that have been instrumental in softening the design of the original proposal and creating something that is more in tune with the community’s vision for the village core. Further refinements will include two chamfered corners as well as a hanging clock/sign on the southeast corner of the property. The wall proposed at the edge of the southeast corner is planned to be built using the existing foundation stones from the Falls House. This will allow the property to front the intersection nicely and will also provide a buffer between the road and proposed patio. It will also provide some uniformity with the two other gateway features at this intersection. Removal of the guard rail will also take away some of the industrial feel of the intersection. While the zoning application was approved last week, the design will be finalized in the weeks that follow. I want to take this opportunity to thank representatives from the Manotick Village & Community Association, the Manotick Culture, Parks & Recreation Association, the Manotick BIA and the Rideau Township Historical Society for their input throughout this process. We also had two other community leaders assist and I owe a debt of gratitude to them as well. Thanks as well to the community for their input in recent months on this proposal. The other local item is the 1353 Scharfgate report. This is a development application from Cavanagh and John Gerard Homes in the pre-existing development off of First Line Road. The address is misleading as the current property does not, and will not, have access onto Scharfgate Drive. The development will see McManus Avenue extended through it with the creation of 16 new lots and a park. One of the main issues that came up during consultation was the proposal to build the development with open ditches. Nearby residents were concerned about this lack of conformity with the rest of development. Following this, we were able to work with the developer on achieving that conformity. Therefore, all 16 lots will feature closed ditches. Work continues to progress on the McLean Bridge Rehabilitation project on the Barnsdale Road in Manotick. Over the last two weeks, the portable temporary traffic control signals (PTTS) were set up and vehicular traffic, pedestrians and cyclists are moving well. The temporary sidewalk on the north side was also installed. The existing asphalt surface on the south side of the bridge deck was removed and had its surface prepared for new asphalt. The turbidity curtain was placed in the Rideau River. The installation of the turbidity curtain is an environmental protection measure that is required on bridge rehabilitation projects over water. The re-facing of the pier caps below the bridge deck also started. The old bridge railings on the south side of the bridge have been removed and the suspended platform that allows for worker access has been installed. Over the next two weeks, the re-facing of the pier caps below the bridge deck will continue and the removal of the old sidewalk on the south side of the bridge will be started. Next week, work will commence on the removal and replacement of the bridge expansion joints. Construction is continuing on the Richmond Forcemain project. Bypass pumping of the Richmond Sewage Pumping Station into lagoon cell ‘C’ has started and will continue until the week of July 24th. This allows for the repairs to the existing forcemain to be carried out. In the coming weeks, there will be localized works along the property line behind the Dallaire Street properties. The contractor will continue to bring in construction materials to site such as granulars, pipes and fitting materials and they will continue the installation of a granular access road from Eagleson to the west limit of lagoon cell ‘C’. Streets in the construction zone will be monitored daily for construction debris and clean as required. If you would like to receive regular updates about this activity, please contact David Brown at David.Brown2@ottawa.ca. Ottawa Public Health has been advising Ottawa physicians and the public since April 2017 that all parts of Ottawa should be considered risk areas for Lyme disease. The prevalence of Lyme disease in blacklegged ticks will fluctuate in time and geographically throughout the Ottawa region. However, as mentioned, all of Ottawa is considered a risk area for Lyme disease. Lyme disease is an infection caused by a bacteria transmitted through the bite of an infected tick. Not all ticks carry Lyme disease. In Ontario, Lyme disease is spread by the bite of a black-legged tick, commonly known as the deer tick. Most humans are infected through the bite of an immature tick called a nymph, which is very small and are most active in the spring. Adult ticks are larger and active during the late summer and fall. Ottawa Public Health has put together Lyme disease “kits”, which are available for pickup free of charge at the North Gower Client Service Centre for your information, use and distribution. Each “kit” includes a Lyme disease factsheet, which offers details related to the symptoms of Lyme Disease, tick removal processes, testing protocols and ways to prevent tick bites. The kits also include a tick key, which is designed to help remove any tick that may have attached themselves to a person, a family member, friend or pet. The Client Service Centre is only open on Thursdays. If you are interested in receiving a kit, you can also contact Wendy Eberwein at Wendy.Eberwein@ottawa.ca. For more information on how to protect yourself and your family, please visit www.ottawa.ca/lymedisease. The City is currently working on the design of Blue Rock Park in Kars with the intent on renewing the park in the spring. Unfortunately, due to printing timelines, I wasn’t able to provide as much notice via this column as I would have liked. However, comments are still being accepted until July 14th. You can find out more about the proposed options at www.rideaugoulbourn.ca/blue-rock-park. While local resurfacing projects on William McEwen Drive, Shea Road and Bleeks Road are slated to commence shortly, another resurfacing project will likely have a significant impact this summer on Rideau-Goulbourn residents. A Commence Work Order has been issued for the resurfacing of Prince of Wales Drive. Construction along Prince of Wales Drive, between Strandherd Drive and Hunt Club Road, is scheduled to begin June 5th. 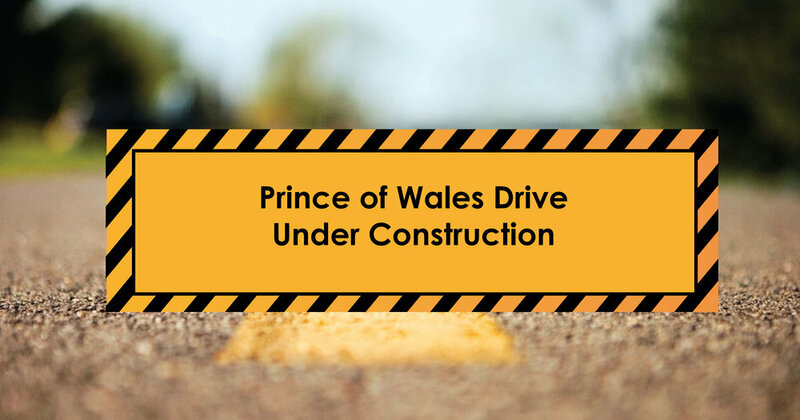 The Contractor will maintain a minimum of one lane of traffic in each direction along Prince of Wales during daytime hours (5:00am‐7:00pm). The staging and sequencing of construction will on occasion require sections of Prince of Wales to be left as compacted granular material, but the distances for these granular surface areas will be limited, and the length of time which these areas have a granular surface will be restricted to 1-2 days, weather-permitting, before the asphalt can be placed. A nightly detour of Prince of Wales northbound traffic, from Strandherd Drive to Fallowfield Road, was permitted under the Contract in order to complete the project this construction season while minimizing impacts to commuting motorists. The proposed nightly closures of northbound Prince of Wales Drive, from Strandherd Drive to Fallowfield Road, are currently scheduled to begin the evening of Sunday, June 11th. The nightly closures of northbound traffic, between 7:00pm and 5:00am, will last approximately two months. Overnight works are scheduled from Sunday night to Friday morning of each week. There are no proposed weekend closures of Prince of Wales scheduled at this time. The signed detour route for the northbound closure will be to direct traffic west along Strandherd Drive to Woodroffe Avenue, north along Woodroffe to Fallowfield Road, and east along Fallowfield to Prince of Wales Drive. The City will be installing digital messaging signs along Prince of Wales Drive to notify commuters in advance of the nightly closures. Cyclists will be encouraged to use alternate routes during construction and a cycling detour route will be signed. The Annual General Meeting for the North Gower Recreation Association takes place on June 19th at 7:00pm at the Alfred Taylor Recreation Centre. The NGRA has oversight for the Alfred Taylor Centre and the Gerry Lines Bowling Alley. They also run events such as Christmas in the Gower and Canada Day in the Gower. All are welcome to attend the AGM. Artists are invited to submit a bid to enter into a contract with The Richmond Village Association (RVA) to commission the 7th mural in the Richmond Heritage Mural Gallery. Richmond was founded in 1818 as a British Settlement and is the oldest village within the current City of Ottawa. In 2018, Richmond, Ontario will celebrate its 200th anniversary. A variety of events will happen throughout 2017 and 2018 to honour Richmond’s past, celebrate its’ vibrant present and look forward toward the future. To commemorate Richmond’s Bicentennial, the Richmond Village Association is undertaking to add the 7th mural to The Richmond Heritage Mural Gallery on the Richmond Memorial Community Centre. The mural is to be completed and installed so that the unveiling of the mural can take place on Friday, June 25th, 2018. Bid evaluation will be carried out by the RVA and will be based on a combination of artistic merit, quality of previous work as provided in your portfolio, quality of material offered and price. To obtain the complete RFP Package, email David Proulx, President RVA at davidproulx@richmondvillage.ca. Join me on July 7th for the Scott Moffatt Golf4Youth Classic Presented by Caivan Communities at the Canadian Golf & Country Club. It promises to be a fun day for the whole family with all proceeds going directly to the Youth of Manotick Association (YOMA) and the Richmond Youth Centre (RYC). I would love for you to participate! We are also acquiring sponsorships and silent auction donations. If you are a local business and want to be involved in this event, please contact me and we’ll find an exciting way to get you involved. For more details or to register, visit www.golf4youth.ca. Hopefully we can make this a successful event that will benefit kids and families all across Rideau-Goulbourn. In my most recent column, I included information on the, at the time, upcoming meeting of the Agriculture & Rural Affairs Committee. Please note that, due to a small and non-urgent agenda, the meeting for March 2nd was cancelled and the two agenda items will be deferred to our April 6th meeting. Motorists and cyclists are advised that Greenbank Road, between Jockvale Road and Half Moon Bay Road, will be closed from Monday, March 6th at 9:00am until Sunday, March 19th. The closure will allow for the installation of two box culverts as part of the ongoing Mattamy Half Moon Bay Development. During the closure, detour signage will be in place. Access for local and emergency vehicles, and for pedestrians, will be maintained at all times. From now until mid-July of this year, Hydro Ottawa will be undertaking a project that involves rebuilding the existing hydro pole line on Fallowfield Road (between Old Richmond Road and Shea Road). Impacted residents have already received notice of this work as it was scheduled to begin in January. In total, 90 hydro poles will either be replaced or newly installed along the north side of Fallowfield Road. Any primary poles that are currently located on the south side of Fallowfield Road will be relocated to the north side due to a gas main. This work will improve the reliability of the electrical distribution system in the area. Residents will notice an increased construction presence throughout the duration of the project, including excavation activities and construction vehicles. In order to minimize noise concerns, Hydro Ottawa will ensure that work is completed weekdays between 8:00am and 5:00pm. Traffic control will be implemented when required to ensure that roads and driveways remain accessible and safe to residents. Hydro Ottawa’s qualified staff and contractors will conduct this work safely and efficiently, ensuring that any inconvenience is minimal. Hydro Ottawa is committed to delivering safe, reliable electricity service. If you have any questions, please do not hesitate to contact Ainley Ching, System Designer, who has been overseeing this project. Ainley can be reached by phone via email at ainleyching@hydroottawa.com. A local Manotick resident is heavily involved in the upcoming showing of an award winning film about Post-Traumatic Stress Disorder. ‘Almost Sunrise’ will be shown in Ottawa on Saturday, March 18th at 3:30pm at the Mayfair theatre, 1074 Bank St. This film features a PTSD program called Project Welcome Home Troops that specifically targets veterans but also ‘first responders’ in their struggles with post-traumatic stress. “Almost Sunrise” follows two Iraq war veterans, both of whom are tormented by depression years after returning home and are pushed to the edge of suicide. Together, soldiers Tom Voss and Anthony Anderson embark on an extraordinary journey: a 2,700 mile walk across the country from Wisconsin to California, in order to reflect on their haunting experiences of war and to ultimately save themselves. The film explores the impact of post-traumatic stress disorder and moral injury on soldiers, and the lengths necessary to overcome difficulty. As part of their journey to wellness, the soldiers utilize meditative breathing techniques. Project Welcome Home Troops (PWHT) is the featured as the method of treatment in the film and was started 12 years ago in the US to help veterans deal with the effects of PTSD. PWHT Canada is an organization of highly trained volunteers who teach veterans ancient breathing techniques enabling veterans to move quickly beyond the effects of their traumas empowering them to get back in touch with their true nature/self. Currently PWHT Canada is teaching veterans in the Kingston and Ottawa areas. Ever wanted to be a Luger? The Ontario Luge Association in collaboration with the International Luge Federation is presenting a 3 day training camp at Edelweiss on March 14th, 15th and 16th. This is a rare opportunity and definitely one not to be missed. Some of you may have seen the media stories out of Manotick recently about the Mino family and their backyard luge runs. This camp is a reality all because of their story. 1988 Calgary Olympian Chris Wightman reached out to the Mino family and the rest is history. Timed Race on the last day! For those interested, please email Cassandra.Mino@gmail.com or contact her by phone at 613-852-6466. It's time to raise money for Multiple Sclerosis again. With Kirsten Mooney organizing her 6th Annual Zumba MS Fundraiser, this is a great time to come out and dance it up. Tickets are $10 with all proceeds going to the MS Society; receipts will be issued for donations of $20 or more. This year’s event takes place on Friday, April 7th at the Alfred Taylor Recreation Centre at 7:00pm. For more information, please contact Kirsten at 613-851-4589 or by email at mkmooney17@live.com. On March 20th, 7:00pm, The Oasis in Kanata, a place for caregivers of people with mental illness, will present “Gaining and Maintaining Balance.” Dianne Blackburn, a Social Worker and Therapist with over 25 years of experience in the mental health field, will discuss how caregivers can support their loved ones with their mental illness while continuing to have lives of their own. Admission is free and all welcome. This event will be held at the Glen Cairn United Church, 140 Abbeyhill Drive. Visit www.TheOasisKanata.ca for details. Charlie Lafferty is being waked in grand style in his home away from home, the local pub. Come and join Charlie's widow, his sweet daughter, bumbling son-in-law, the parish priest, and the savvy innkeeper as they celebrate the life and times of ramblin', gamblin' Lafferty through stories and song. This is the second show in ITR’s celebration of Canada’s 150th birthday and is a reflection of the Canadian mosaic - our rich cultural heritage from afar. The show will be performed at the Osgoode Community Centre Hall, 5660 Osgoode Main on April 28th and 29th as well as from May 5th to the 7th. Tickets are $20 for adults, $16 for seniors/students and $55 for ITR’s yummy dinner theatre. Tickets went on sale March 6 and can be purchased at www.itrtheatre.com, tickets@itrtheatre.com and 613-800-1165. In last week’s column, I included information on the upcoming meeting of the Agriculture & Rural Affairs Committee. Please note that, due to a small and non-urgent agenda, the meeting for March 2nd was cancelled and the two agenda items will be deferred to our April 6th meeting. At the City Council meeting of February 22nd, I had the pleasure of joining Mayor Jim Watson in presenting the Mayor’s City Builder Award to Munster’s Bob Easy. Bob Easy has been involved in building and supporting youth in the communities of Munster and Richmond going back to the 1970s. The sense of community and of family he established among the teams he coached was sadly evident in 2012 when one of Bob's players, Tyler Kerr, died tragically during a game due to a heart condition. Bob took it upon himself as head coach to support the boy's family, his team and coaches, and the opposing team, by arranging grief counselling. He also organizes fundraising events to assist local players whose parents are unable to fully afford the cost of a hockey season; players who have been given the opportunity to play at a higher competitive level but whose parents are not able to pay the fees associated with that. In 2001 Bob was presented with a plaque in recognition of his outstanding service to Minor Hockey under the Ottawa District Minor Hockey Association. In 2009-10 he was honoured as Coach of the Year by the Richmond Munster Minor Hockey Association for his special dedication to player development and team play. In 2014 Bob was presented with the Bill Kitchen Award for his devotion of time and effort to strengthening minor hockey in the community. Bob was also involved in umpiring for fastball in Kanata for many years, and in slo-pitch in North Gower, Richmond and Munster in his later years. He is also involved in the Munster Co-operative Nursery School's annual ball tournament in June. There aren’t too many community events in which you don’t see the always recognizable Bob Easy involved in some way. Just recently, Bob and I both took a few pies in the face at the Munster Harvest Fest. Fortunately for me, I don’t have Bob’s beard so the clean-up was much easier. Congratulations Bob! It is a well deserved honour. The Agriculture and Rural Affairs Committee (ARAC) meeting scheduled for Thursday, March 2nd has been cancelled due to a light agenda. The items will be moved to the next regularly scheduled meeting on Thursday, April 6 at 10 am in the Chambers, at Ben Franklin Place. The North Gower Cooperative Nursery School is holding its annual fundraising event on Saturday, February 25th at the Alfred Taylor Recreation Centre. The North Gower Country Kickup will feature the musical stylings of Brea Lawrenson with the Jordy Jackson Band as the opening act. The event starts at 8 pm and runs until 1 am. Keep in mind that I live nearby so try to keep it down! Tickets and information can be found at www.countrykickup.com. On February 28th, from 5 pm to 7:30 pm at the Alfred Taylor Recreation Centre, come and enjoy a hearty supper of pancakes and syrup, ham, sausages, baked beans, fruit salad and homemade pies, with coffee, tea, juice or water. Cost is just $10 per adult, $5 for children 6-12, and children 5 and under free. This supper is hosted by Holy Trinity Anglican Church, North Gower. For more info, call 613-489-2207. The City has received a Site Plan Control application for the development and that information is now publicly available at ottawa.ca/chateaulaurier. Members of the public have 28 days to review the project and submit feedback, including through an online form and via email at chateaulaurier@ottawa.ca. The proposal will be refined by City staff following their review and public feedback. Owing to the local and national importance of the Château Laurier, a special heritage working group, comprised of nationally respected heritage professionals and a representative from Heritage Ottawa, has been established to provide advice to the applicant, the City, and the National Capital Commission. There will be additional opportunities to provide feedback before the project comes before Council, including when it considered by the Committee of Adjustment, Built Heritage Sub-Committee, which I sit on, and Planning Committee later this year. The City will also organize a community session for information and comments before these committees review the proposal. I strongly encourage you to submit comments on this proposal. I have been very critical of the proposed expansion as I feel it completely detracts from the hotel. This is a building that has seen an expansion before and that was done tastefully. I see no reason why the same approach cannot be taken here. It will be interesting to see how this file moves forward and how impactful public input will be. To begin this week, I just wanted to correct a comment that I have made in recent weeks. When providing background on the stormwater issue, I had said that Council made the decision to shift all stormwater costs to the water and sewer rate in April of 2001. In fact, it was the Corporate Services and Economic Development Committee that dealt with the issue in April. They ended up deferring the matter to their July 3rd meeting and Council did not approve it until their July 11th meeting. The report was titled “Financing Methods – Funding City Services” and included two key points that led us to the situation we are in today. One was that the General Tax Levy “include all services formerly included in the general levies of the area municipalities except…stormwater management.” Further along in the same motion, the Committee recommended to Council that “the stormwater management and sanitary sewerage programs be totally funded from sewer surcharges.” This passed at Committee and again at Council. Interestingly enough, Councillor Janet Stavinga actually voted against the matter at Committee. We are only dealing with this matter today because the rest of Council did not follow her lead. If you would be interested in reading the minutes or the report for yourself, please contact my office. For those of you who have attended one of our Mid-Term Town Hall meetings, you will know that we discuss the stormwater issue there. Although this item has been discussed at Committee this past Tuesday, I will continue to focus on the matter at future town hall meetings. With meetings in North Gower and Munster having occurred earlier this week, our next Town Hall meeting will take place at the Christ Church in Ashton on Wednesday, November 1st followed by our rural Stittsville meeting at the Goulbourn Town Hall on Monday, November 7th. Both meetings will begin at 7:00pm. The report on Coach Houses came before the Agriculture and Rural Affairs Committee on Thursday, October 6th. Some of the recommendations contained in the report stemmed from consultations in the urban area but the ensuing recommendation had a city-wide impact. As a result, ARAC voted to alter a recommended decrease in accessory building heights because this was not a prevalent issue in the rural area. Further, we discussed the minimum lot size for a coach house. The recommendation calls for a minimum lot size of 2 acres on private services. This is something that we are reviewing and, at the very least, members of ARAC will be pursuing a decrease in that minimum to 1 acre at the October 26th meeting of Council. The main point, however, is that the City has developed a process that will permit the addition of coach houses in the rural area and across the city. All that is left to work out are some fine details surrounding lot sizes and permitting. I will keep you updated on the matter in future columns. In November, the updated report on LEAR will come to both the Planning Committee and the Agriculture and Rural Affairs Committee. As Chair of the LEAR Working Group, this is something we have been working on for the better part of four years. The most interested parties in this endeavour would be landowners in or adjacent to lands already designated as Agricultural Resource Area on Schedule A of the City’s Official Plan. The Regional Municipality of Ottawa-Carleton identified the existing Agricultural Resource Area in 1997 using a Land Evaluation and Area Review (LEAR) system. Key components of the LEAR system are soil capability for agriculture, land use and parcel size. New soils mapping and changes in land use and the size and nature of farms in the city over the last 20 years warrant re-examining and updating the existing LEAR system. The Ontario Municipal Board has also directed the City to complete this update. The LEAR Working Group is finalizing the changes to the LEAR system. Recommendations on possible changes, if any, to the Agricultural Resource Area will be made and notice of changes will be sent to all affected land owners. A draft Official Plan Amendment will be advertised, circulated and presented to the Agriculture and Rural Affairs and Planning Committees in November 2016 and Council in December 2016/ January 2017. If you have any questions on this review, please contact Bruce Finlay, Planner, at 613-580-2424, ext. 21850 or by e-mail at planning@ottawa.ca. Our Mid-Term Town Hall series continues next week with meetings in North Gower and Munster. Residents are invited to come out to the Alfred Taylor Recreation Centre on Monday, October 17th and/or the Munster Community Centre on Wednesday, October 19th. Both meetings begin at 7 p.m. The meetings are general in nature and will discuss various city-wide issues as well as local issues. The stormwater matter comes to Environment Committee on Tuesday, October 18th so the North Gower meeting would be good to attend if you wish to chat with me in person prior to any vote on the proposed stormwater fee. As you have read in this column previously, the owner for the building known as the Falls House at the corner of Bridge Street and Manotick Main Street had applied for a demolition permit. The demolition permit was officially issued on September 26th. This week, you will likely begin to see some work around the property as the owner will be removing parts of the home that can be reused in any future development. Over the last few weeks, I have been working with the owner on some last ditch efforts to salvage the home, including relocating it to the other vacant parcel across the road. Unfortunately, that effort proved fruitless. From the standpoint of documenting the property, I did another walk through on Thanksgiving Monday and took pictures and video of the interior. My office will get the video and the pictures on our website as soon as possible so that every resident can take a virtual walk through. In the meantime, I continue to work with the property owner on design for the replacement office building. As of now, nothing is set in stone while we carry out these discussions. My work on this involves consultation with the same community leaders that first toured the property with me several months ago. Community organizations that are represented in this group include: the Manotick Village & Community Association; the Manotick Culture, Parks & Recreation Association; the Manotick Business Improvement Area; and the Rideau Township Historical Society. They have all been a tremendous resource for guidance as we move forward on this difficult file. Over the last couple of years, the community has been working on a plan to expand the dressing rooms at the Manotick Arena. I always hear rumours out there so wanted to provide a brief update. The City has been finalizing floor plans for the four new dressing rooms in recent weeks in partnership with our local committee and the Osgoode-Rideau Minor Hockey Association. The second floor expansion plans were coordinated with Rural Ottawa South Support Services and the Youth Association of Manotick. The finances are in place for this and once we get the design finalized, we'll move into the tendering phase. Construction is slated to begin in March or April. Should the dressing rooms not be completed by October, the City will take the necessary steps to find alternative rooms on a temporary basis. I do know that the Manotick Culture, Parks & Recreation Association plans to host a meeting with the community to showcase the final plans as soon as they are available. I will be working with them to co-host this meeting. Stay tuned to this column for updates. The Richmond Village Association and the Richmond Youth Centre Volunteers are excited to announce the expansion of the youth centre to everyone between the ages of 8 and 11. As a result, they want to invite everyone to stop by and check out their Open House on Friday, October 14th from 7 p.m. to 9 p.m. This will be an opportunity to meet the facilitator and volunteers as well. The Richmond Youth Centre’s new programming will begin on October 28th. The program will run from 6:30 p.m. to 8:30 p.m. for ages 8-11 and from 8 p.m. to 10 p.m. for ages 12-16. The Youth Centre is located on the second floor of the Richmond Memorial Community Centre and is free to attend. A couple of weeks ago, I mentioned that the Woodroffe Avenue closure was to come before Planning Committee on February 11th. Unfortunately, the closure was approved and will move forward. One individual from Manotick came down to City Hall to speak against the closure and I very much thank him for taking the time to do so. Many other residents submitted their concerns via email. I am not a member of the Planning Committee so I did not have the ability to vote against the closure although I was present to speak against it as well. In the end, the planning that took place after the initial decision to close it in 1997 was too strong with its legal and financial implications and Committee ultimately approved it. The item does not rise to Council, therefore I will not have an opportunity to officially register a vote against it. I’m sorry that I couldn’t have done more to prevent this closure. As I have discussed in this column in the past, the City of Ottawa is undertaking the Carp Road Widening Environmental Assessment Study. The City’s Transportation Master Plan identifies the need for Carp Road widening from two lanes to four lanes between Highway 417 to Hazeldean Road as a Phase 2 project to be completed between 2020 and 2025. This was a project originally scheduled earlier but affordability has pushed that project back. This second Open House, to be held at the Goulbourn Recreation Complex on Wednesday, February 26th from 6:30pm until 9:00pm, will provide an overview of study progress to-date, including the alternative designs considered and the evaluation criteria and methodology used to determine preliminary preferred design for the corridor. Your participation in Open House meetings is important where you can discuss the project with the study team and provide feedback. There will be on-going public consultation activities during the remaining course of the study. Further information on the Carp Road Widening EA Study is available at ottawa.ca/carproad. Interested persons can provide comments throughout the EA process. Any comments received will be collected under the Environmental Assessment Act and, with the exception of personal information, will become part of the public record. For further information or to provide comments, please contact jabbar.siddique@ottawa.ca. The annual North Gower Cooperative Nursery School fundraising event was a tremendous success last year with their Casino Royale theme. If you missed it last year, this is your chance to see what all the fuss was about. Keeping with the casino theme, the NGCNS invites you to this year’s Casino Las Gower and Silent Auction on Saturday, February 22nd. Try your luck at one of the several casino tables, including Black Jack, Poker, Roulette, and more, or take a spin at the Wheel of Fire. Peruse and bid on the numerous auction items available. Enjoy a snack from The Marlborough Pub and Subway, or satisfy that sweet tooth with a dessert from Cinnamon Catering or Sugar House, and of course the bar is always ready to serve up a cold beer or a tasty martini! I will reprise my role from last year as the master of ceremonies keeping everyone on their toes and well informed about when auction tables are closing to give you that last chance to outbid your neighbours and friends on that item that you just can’t go home without. I look forward to seeing you at Casino Las Gower! The doors open at 8:00pm, and the last auction table closes around 12:00pm. Tickets are $15 which will get you entry, food, and $500 in gambling chips – don’t forget that this is a ‘fun’draiser so chips have no monetary value, although they can be used to purchase raffles tickets for a door prize. Additional gambling chips will also be available for purchase. Tickets can be purchased from: Roxy’s, Perkins Lumber and at the door. Last year, the City of Ottawa approved a Wildlife Strategy that featured education as a strong component. The Speakers’ Series stems from that Strategy. Dr. Stan Gehrt, world renowned wildlife ecologist from Ohio State University, will provide insight on how people in urban and rural developments can coexist with coyotes, at the first event of the City’s Wildlife Speakers’ Series at 7:00pm on Friday, February 28, at Ben Franklin Place (101 Centrepointe Drive). Dr. Gehrt is the lead investigator in the Cook County Coyote Project, which has been studying the coyote population in the greater Chicago metropolitan area since 2000. This project has led to many interesting discoveries about how coyotes behave in different settings, and how they interact with humans and other animals. Dr. Gehrt will share his extensive knowledge and experience to provide a better understanding of coyotes – including how and why they live in settled areas. He will also show how residents can avoid problems with coyotes, such as taking simple preventative measures around their properties. In addition to the presentation, information booths will be on display from 6:00 to 9:00pm for residents to learn more about Ottawa’s wildlife and natural environment. The City will hold three more events in the Wildlife Speakers’ Series this year. The series is intended to increase residents’ knowledge and appreciation of wildlife and promote coexistence through understanding and respect. The next event is planned for April on the topic of Backyard Biodiversity. For more information on the coyote presentation, visit ottawa.ca. Come join the festivities in North Gower! Decorate yourself and your bike in Canada’s Colours and/or theme and join us at the North Gower Marlborough Public School for a parade down to the Alfred Taylor Centre. Prizes for the most unique. All ages welcome to participate. For Safety reasons please encourage your children to stay behind the lead Fire Truck. Join us at the pavilion for the singing of O Canada, greetings from our elected representatives, the judging of the bikes and a slice of cake. Fun for everyone – Gumball bouncing house, volcano climbing wall, kiddie slide, 65’ obstacle course, dunk tank, cow milking, plinko, or challenge friends to the wrecking ball. Bring your lawn chair, relax have a chat with your neighbours, and enjoy the show. Many thanks to our Volunteer Firefighters. Drink slowly – have no more than two drinks in any three hour period. We would also like to remind who are planning to use fireworks this Canada Day weekend to practice caution and comply with the Fireworks By-law to ensure everyone has a safe and enjoyable holiday. The City’s Fireworks By-law outlines the rules around fireworks use. Anyone planning to have fireworks displays over the Canada Day weekend should do so in a safe and courteous manner. Consumer fireworks may be discharged on the day of, the day before or the day after Canada Day. They must be discharged by someone 18 years or older, and on private property, with permission of the property owner. The fireworks display must not cause danger or nuisance to any person or property. It is also important to note that the sale of consumer fireworks, except on Canada Day and the seven business days immediately preceding Canada Day, is prohibited. Display fireworks, such as those on Parliament Hill and smaller-scale versions at public parks on Canada Day weekend, may only be discharged by someone over 18 who holds a permit issued by the Ottawa Fire Chief. Applications for these permits must be submitted 30 days before the intended display. Please review Ottawa’s Fireworks By-law on ottawa.ca for further details. Residents wanting more information or having questions about the Fireworks By-law can contact 3-1-1. Purchase your fireworks from a reliable source. Always read and follow the label directions exactly. Adults must supervise the lighting and handling of fireworks at all times. Always keep water handy (a garden hose or bucket of water). Discharge fireworks away from combustible materials, including buildings and trees. Keep children and spectators a safe distance away from fireworks when the fireworks are discharged. Never re-light a “dud” firework (wait 15 to 20 minutes, then soak it in a bucket of water). Never give fireworks to small children, including sparklers. While sparklers are often considered harmless fun, they can burn twice as hot as a typical kitchen oven (they can burn at 650 C or 1,200 F), can ignite clothing, and cause eye damage and burns. Dispose of fireworks properly by soaking them in water and then disposing of them in a metal garbage can. For more information on fireworks safety please visit Ottawa.ca/fire. This weekend is the perfect time to get out to some Ottawa Farmers' Markets! Farmers' Markets all over Ottawa have opened for the season. We're lucky to have two excellent markets right in the Ward in North Gower and Manotick. Here's a full list of all the markets across the city. OC Transpo has five once-a-week rural shuttles to major malls that are free of charge. On Mondays, Route 201 runs from Richmond and Stittsville to the Bayshore and Carlingwood Shopping Centres. Wednesdays, shuttle Route 203 runs from Dunrobin and Carp to Bayshore and Carlingwood Shopping Centres. Fridays, shuttle Route 205 from North Gower, Kars and Manotick to Barrhaven and Carlingwood Shopping Centre. On Tuesdays, Route 202 runs from Navan, Sarsfield, Cumberland to Place d’Orléans and St. Laurent Shopping Centres. Thursdays, Route 204 runs from Metcalfe and Greely to South Keys and Billings Bridge Shopping Centres. Anyone can use the free rural shoppers' routes. Each route runs one trip to the city in the morning, and one trip returning in the afternoon. Pick-up and departure times vary by route, so please visit www.octranspo.com or call 613-741-4390. Between September and December, I’d like to hold informal town hall meetings in nearly every community in this ward. The idea will be for me to provide an update on what has transpired in the first 24 months and it will also serve as an opportunity for you to raise any issues that you feel I should be focusing on for the next 24 months as well. Column: Good news for Rural OC Transpo Riders! Recently, OC Transpo has made some changes to transit that will affect riders in Goulbourn. After introducing the 201 shoppers bus in January, I noticed that it failed to go through the King’s Grant community which I felt needed to be addressed. I’m going to start off this week with a few quick updates on some meaningful issues around our communities. Looks like I spoke too soon last week regarding the truck traffic resulting from the Mahogany development. The trucks have been diverted from First Line Road/Century Road and have now been instructed to use the existing truck routes accessing their site from south of the village of Manotick. Two major files are coming to Agriculture and Rural Affairs Committee at its March 1, 2012 meeting. The meeting is scheduled for 9:30am in the Champlain Room at Ottawa City Hall. The files are the zoning amendments for the Minto Mahogany subdivision in Manotick and the Maple Forest Estates subdivision in North Gower. Phase 1 of this subdivision was draft plan approved by the Ontario Municipal Board on October 20, 2011. This zoning amendment is to bring the lands in line with the draft plan of subdivision in terms of how the lands are zoned, which is currently Development Reserve. Phase 1 will consists of 197 units, 146 of which will be single detached homes with the other 51 being attached units. There will be two access points, one off of Manotick Main Street across from Antochi Lane and the other will come off of Century Road. Again, all of these details are a part of the Draft Plan Subdivision and the Zoning Amendment is just the next step in the process. As mentioned in a previous column, Minto plans to service all of the Phase 1 lands this summer and expects their sales office to open this fall with first occupancy coming in spring of 2013. Officially known as 2190 Maple Forest Drive, Phase 5 of this development in North Gower was draft plan approved by City Council on August 10, 2011. This development would see 50 homes added to the existing development off of Roger Stevens Drive. If approved, this development would eventually connect the existing development with the back end of the Alfred Taylor Recreation Facility and would include walking paths so that those residents could easily enjoy the recreation facilities. This Zoning Amendment will allow the development to proceed according to the approved site plan. More details on the site plan and zoning for both this and the Mahogany development are available online at www.ottawa.ca/devapps. The Watson’s Mill Team is thrilled to announce that our friends and partners at the Mill Tavern are helping us “Raise the Roof”. The Quiz Night takes place on Tuesday, February 28th and starts at 7pm, with proceeds to the Watson’s Mill roof campaign. Cost is $15/person but the value is priceless. WMMI challenges community members: recruit your friends and family, and see who will champion the evening’s trivia. From personal experience, these quiz nights are a lot of fun and incredibly challenging. They take place on the last Tuesday of each month and proceeds always go to a great cause. Come on out on the 28th and test your knowledge, I know I’ll be there! July 12, 2012 marks the date for my first annual Scott Moffatt Kids Classic Golf Tournament. The event will take place at the Canadian Golf & Country Club near Ashton. My goal is to raise money to help build and replace play structures throughout Rideau-Goulbourn. The tournament date coincides with Take a Kid to the Course Week and I truly hope many parents will bring their kids out for a fun day of golf. I’ll have more details on this event in the coming weeks and months but I’m also soliciting volunteers who would be interested in helping me put this together. I’ll be looking for help with organizing the event, acquiring sponsorships as well as assistance on the day of the tournament. If you are interested, please contact my office and we’ll see how we can put you to work. Hopefully we can make this a successful event that will benefit kids and families all across Rideau-Goulbourn. Free service on new rural shoppers’ Routes until June 30! OC Transpo has added four new once-a-week rural shuttles to major malls that are free of charge until June 30. Four routes serving rural communities in the east and west ends run one day a week – these are in addition to the previously existing Friday shuttle Route 205 from North Gower, Kars and Manotick.